It has taken me 49 years, but I made my first frittata in 2018. When you try to eat lower-carb in your diet, breakfast is often challenging. Stratas and other casseroles sound good, but they contain a high amount of carbs either through bread or potatoes. Carbohydrates, in general, can be confusing to people. Your body needs carbohydrates for fuel and carbohydrates are extremely important in a diet. The key in weight loss success though for me was choosing the right carbohydrates for fuel. When I tell you that I'm eating lower-carb foods then I'm fueling up on lettuce, tomatoes, and vegetables. All of those foods contain essential carbohydrates. I have reduced my intake of refined higher carbs like white bread, pasta, and processed foods. 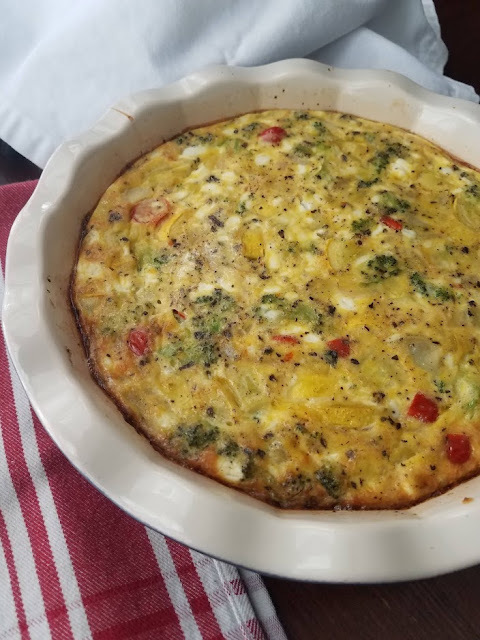 For this lower-carb breakfast frittata, I used 3 squash, a few broccoli florets, 1/2 onion, tsp of minced garlic, a sprinkle of dried basil, 8 grape tomatoes and a handful of cheddar cheese. I used eight eggs plus salt and pepper. Did I measure? No, not really. I sauteed the squash and onion for about 12 minutes until browned and soft. I added the grape tomatoes to add a touch of holiday color to the frittata. You could use any type of vegetables you have on hand for a low-carb frittata. 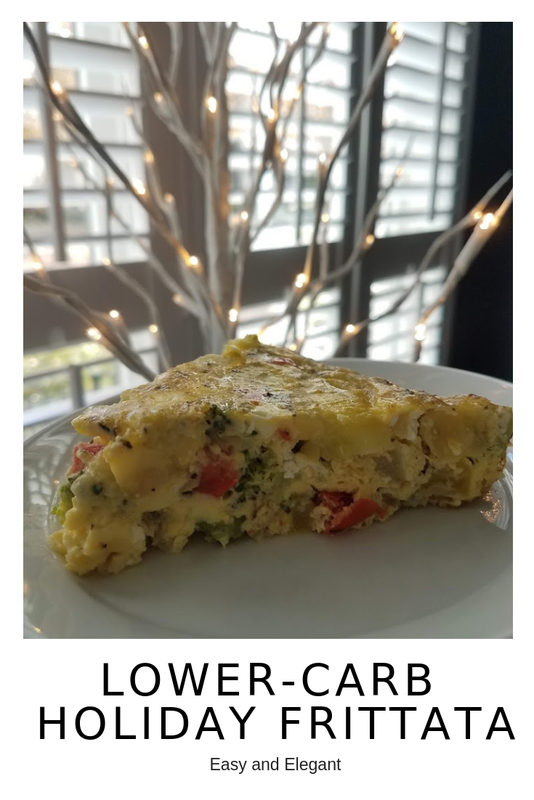 It's lower-carb because it does not have a crust like a quiche. Eggs are a good source of protein and this dish will keep you full most of the day. After sauteeing my veggies, I whisked eight eggs in a bowl. I also added salt and pepper to the eggs. I use Himalayan pink salt mostly in my diet. Pour the veggie mixture into a pie pan. Add the eggs. Bake at 350 degrees for 40 minutes until the center of the frittata is set. 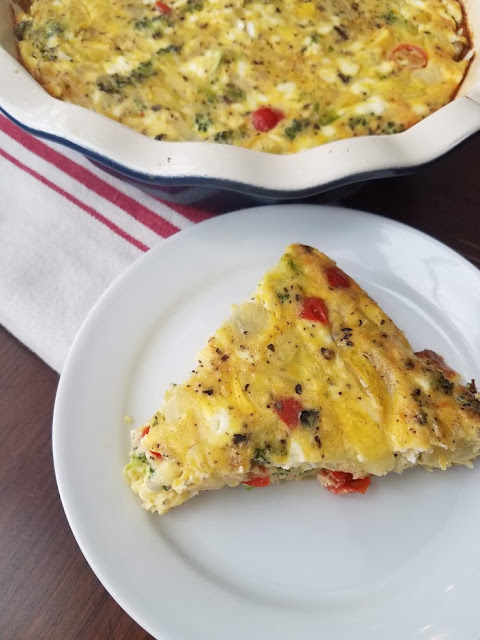 The easy frittata is attractive and would make a great holiday brunch or breakfast idea. 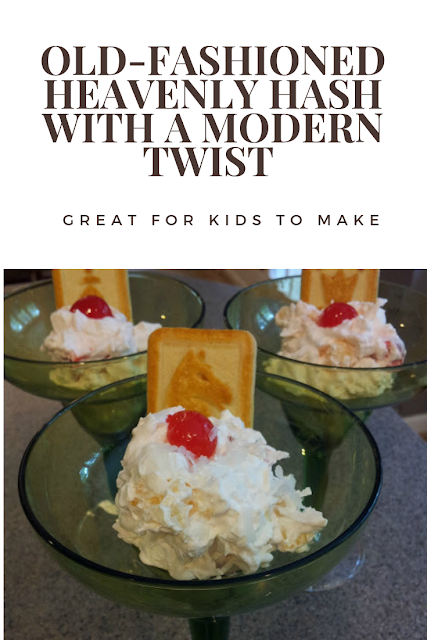 My time for writing and sharing this recipe with you was made possible by Hinessightblog sponsor, North Carolina Nissan Frontier dealer, Don Williamson in Jacksonville, N.C.
My children love dessert. My husband says they got their sweet tooth from me, but I think they get it naturally, from their grandmothers. 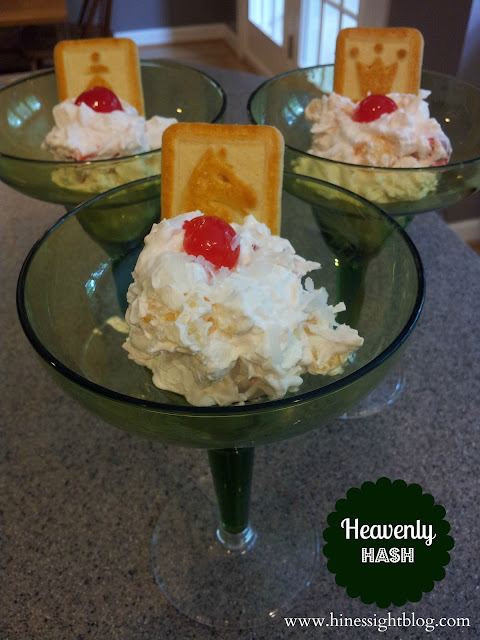 My own grandmother certainly had a sweet tooth, and some of my fondest memories are when I would spend a week with her at her home in Durham, and we would whip up an easy dessert using COOL WHIP whipped topping. She had several in her recipe box, and the best part of cooking with her each summer is that I used to sneak a little finger tasting of COOL WHIP before it was tossed in with the rest of the ingredients. Fast forward thirty-five years, and I’m trying to make some of the same type of memories with my children that I made with my grandma. My son never got the opportunity to meet my dad or his great-grandmother, but he does share a quality that they both had: He loves to cook. 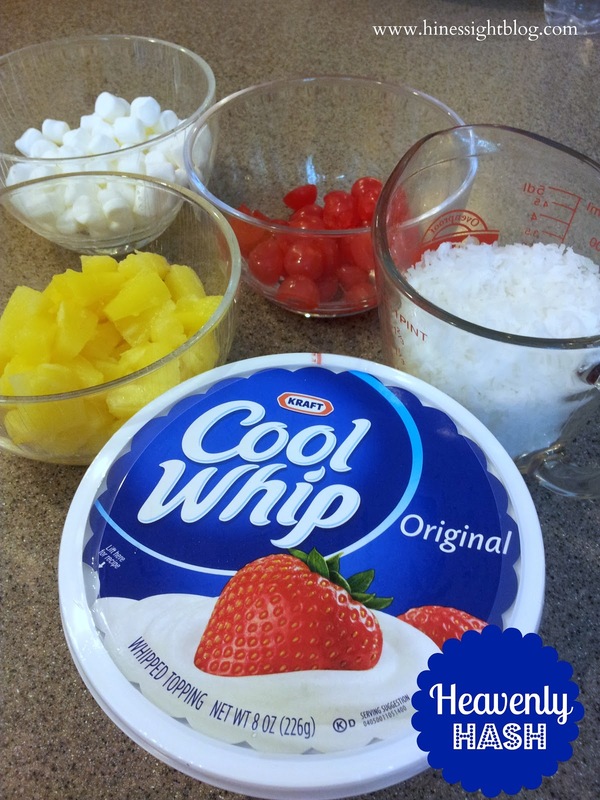 I remember my dad making a great fruit dessert using COOL WHIP as the main ingredient. 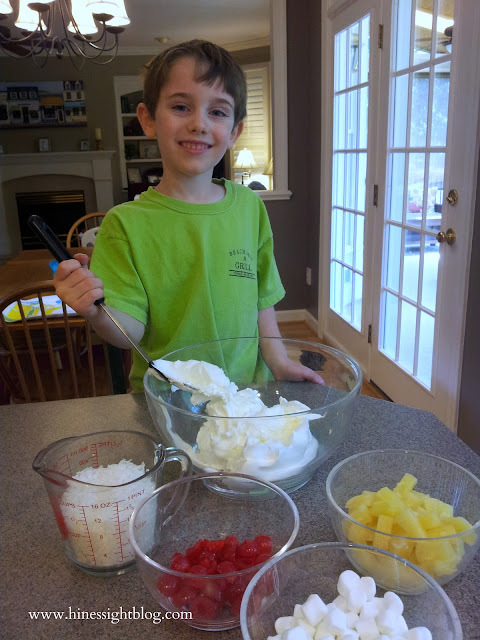 He would mix the topping with coconut, marshmallows, and fruit. It was simple and delicious. 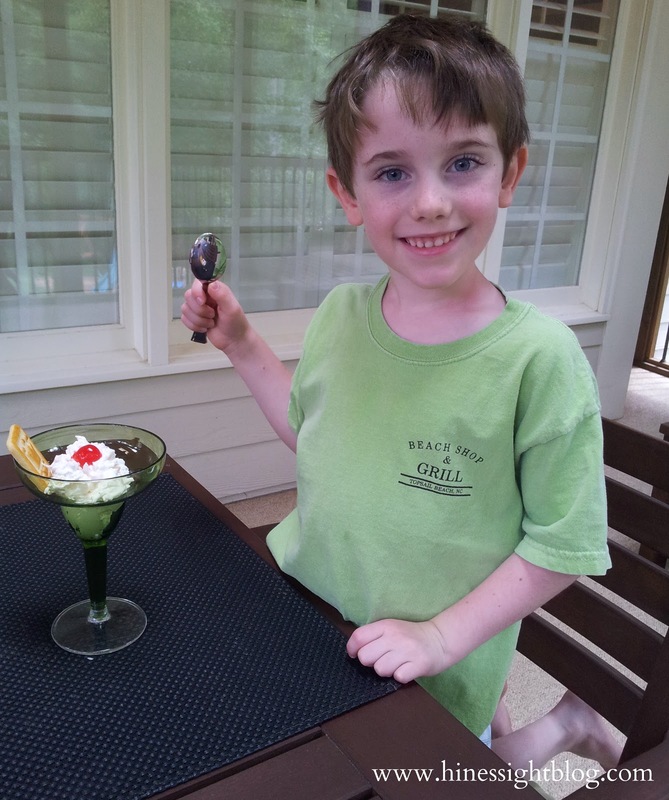 I’m fairly certain that he grew up having this everyday dessert often, especially during the summer months. I never made it with my grandmother, but I certainly remember eating it at a lot of family reunions. My family is now making this special COOL WHIP dessert. I don’t have the exact recipe that my father or grandmother used, but one of my church cookbooks had something very similar to my family’s recipe. My dad used mandarin oranges, but we’re whipping up this everyday delight with pineapple today. The taste is old-fashioned, but I’m serving it with a modern, cosmopolitan twist. Mix all ingredients together. 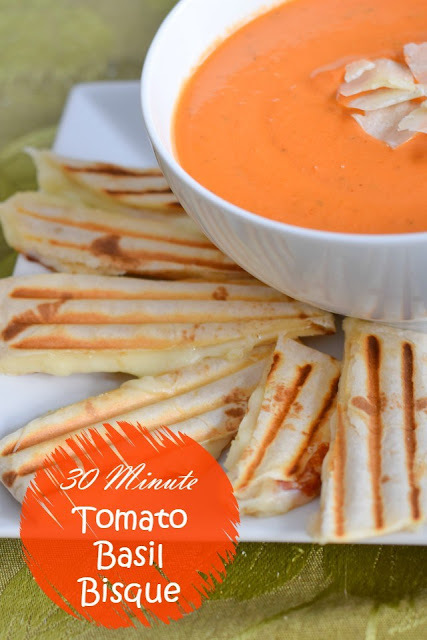 Refrigerate for at least an hour. Garnish with Chess cookie. This dessert needs to chill an hour before serving, so we make it in the afternoon, and then it’s ready that evening for dessert, or it can even be served as an afternoon treat on a Sunday as soon as it is ready. It’s simple. It’s delicious! And I love that my children are going to have special summer COOL WHIP memories just like me. When I'm feeding a crowd, I always look for recipes that are easy. 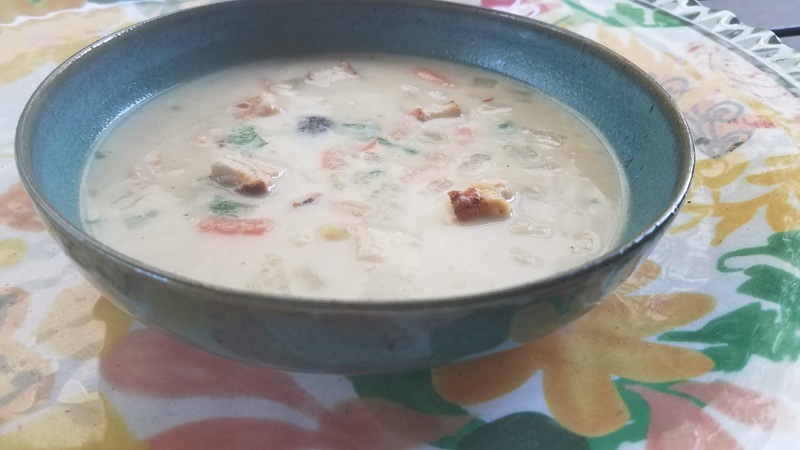 I first served this white bean chicken soup earlier this fall and I thought it was great. My mother-in-law was such a fan of this easy chicken-based soup that she wanted me to text her the recipe the next day. I liked this chicken soup so much that I plan to serve it to friends at a holiday gathering later this month for the holiday season. Surprisingly, the recipe originated from a Southern Living kid's cookbook that I bought years ago. This white bean chicken soup can easily be doubled for entertaining. You could also saute your own boneless chicken and use a rotisserie chicken breast seasoning instead of deboning a chicken from the store. This easy chicken soup takes on a holiday look when you add cilantro for a touch of green. I hope you enjoy it as much as my family did. It also freezes well. **You can double the recipe, but I still use only one onion. If the chicken soup is too thick, you can add water or extra chicken broth on the reheat. Melt butter in a large pot over low heat: add carrot, onions, and garlic. Saute until tender then stir in chicken, chicken broth, green chilies, cumin, and red pepper. Bring soup to a boil over medium-high heat. Reduce heat, cover, and simmer 20 minutes. Place beans in a medium bowl and mash using a potato masher until about half the beans are still whole. Add beans and the whipping cream to the chicken soup mixture. Cook 10 additional minutes, stirring frequently. Stir in cilantro (optional). 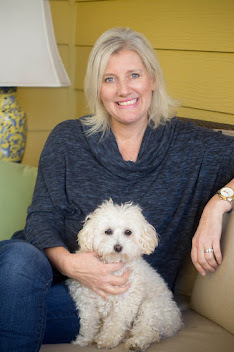 My time for writing and sharing this blog post is made possible by sponsor, Rivenrun Dental in Richmond, Virginia. When you drive down Highway 70 between the cities of Raleigh and Durham, North Carolina, you will spot an iconic red barn that has created pure holiday magic in the Triangle for families for more than 50 years. 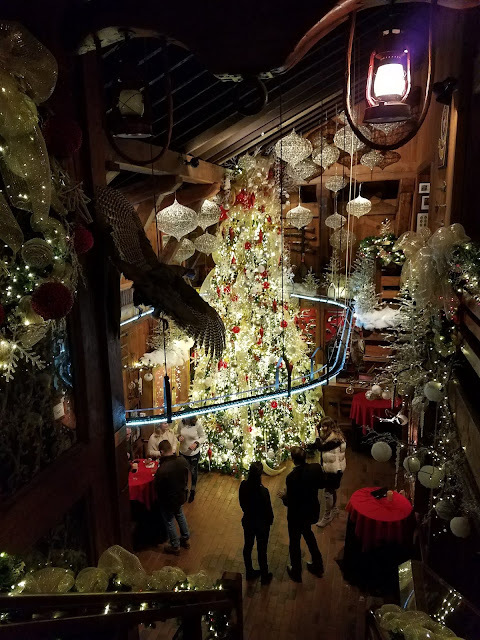 And every year, holiday decorations at the Angus Barn, a premier steakhouse in Raleigh, gets better and better. 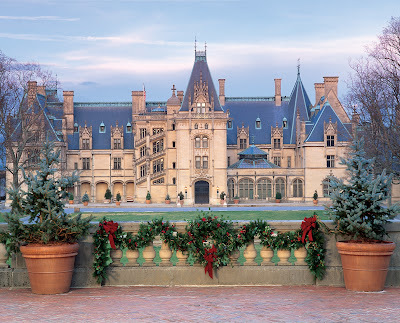 It's like the NC's mountain's Biltmore Estate for the eastern part of North Carolina, just on a smaller scale. The exterior of Angus Barn twinkles as soon as you see it. 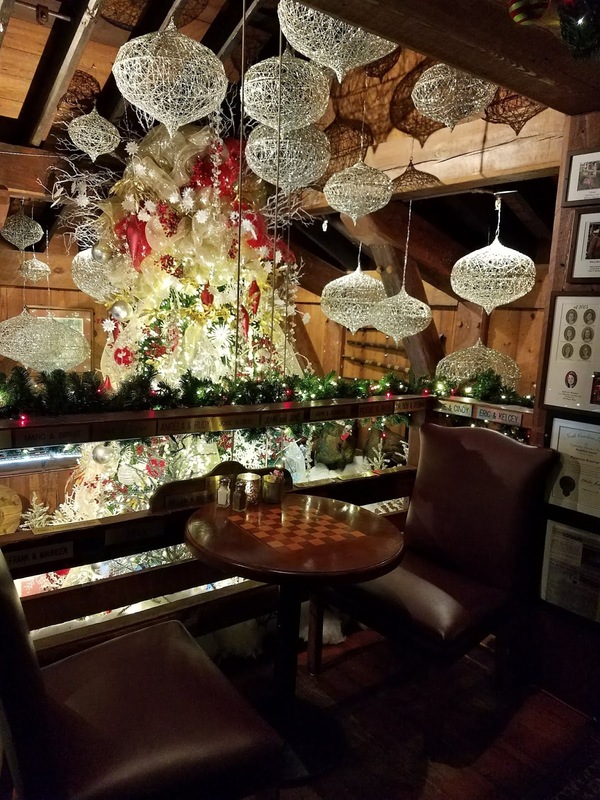 It's surrounded by car lots and commercial businesses now on a very busy highway, but despite the hustle and bustle around it, the Angus Barn still projects that same holiday magic of yesteryear. When this restaurant was first established in 1960 in Raleigh, it was located in the country. Seriously, the country! The country where you would see barns in rural North Carolina. I have photos of my parents all dressed up attending business Christmas parties. 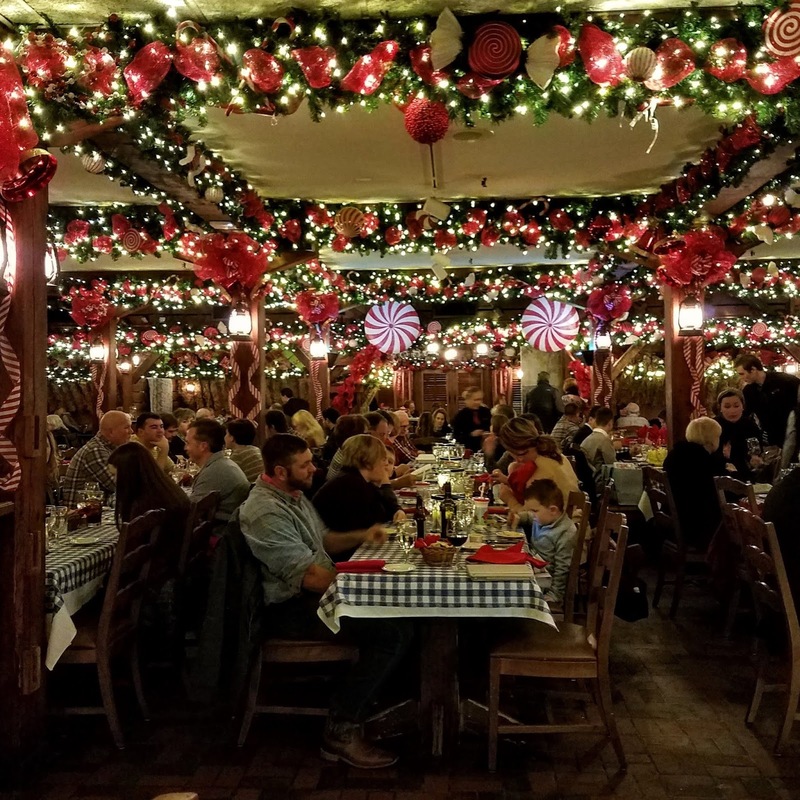 Even though Raleigh's Angus Barn is spread among urban sprawl on Highway 70, it is one of Raleigh's most iconic places to visit, especially during the holidays. The Angus Barn still maintains its country roots with a rustic, elegant interior. But, this is no country Cracker Barrel even though there is the Angus Barn Country Store which sells its famous cheese and crackers. 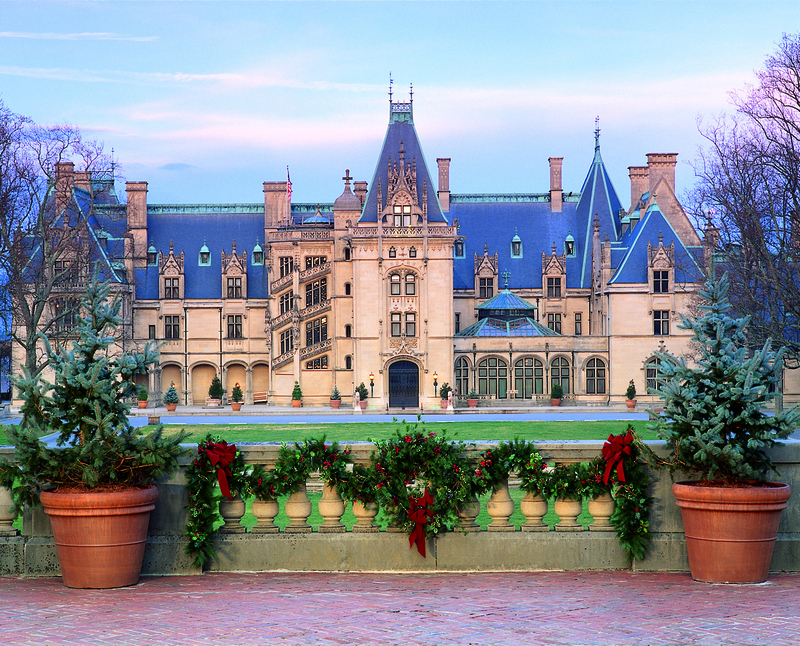 Of course, Angus Barn elves are modern now and they ship everywhere so non-Southerners can have a little taste of what's so great about Raleigh destination. With most entrees priced above $30 and a children's menu starting at $14, it's a place where many Southern families splurge during the holiday season. People flock here because it's an experience like none other. A purely magical, joyous experience for kids. To dine during normal dining times like 5:00 pm to 8:00 pm, in December you may need to make Angus Barn dinner reservations up to a year in advance. The Angus Barn extends its hours during the holiday season though, and if you can sit down to eat dinner at 10:00 pm, then you probably can snag a reservation during this busy time for the restaurant. Dinner at the Angus Barn is steeped with tradition, and unlike most high-end steakhouses in America these days, they do not do that a-la-carte business of sharing a larger side with the table. Your 14-ox "IronChef" Ribeye (Oh, yeah. There's that, too. Angus Barn Executive Chef Walter Royal won TV's Iron Chef Competiton. He beat chef Cat Cora) comes with your choice of soup or salad and a side. Bread, homemade crackers, cheese, and fresh raw veggies are on the table for every Angus Barn diner to enjoy. Even for non-beef eaters, the Angus Barn menu has something for everyone to enjoy. 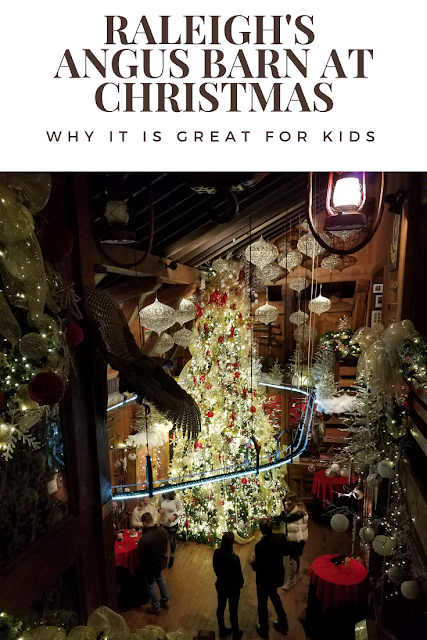 But, the view of the Angus Barn restaurant through the magic of a child's eye is where this eatery has its edge. 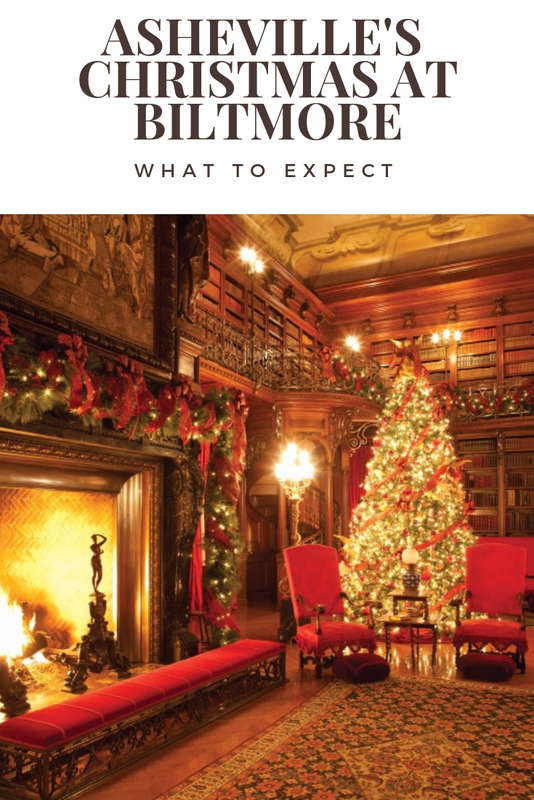 Beautiful trees, appearances by Santa, life-sized elves greeting you at the door with homemade gingerbread cookies, and hot cocoa. It's like North Carolina's own North Pole. There is a toy box for kids, and kids are taken into the kitchen by staff to make their own dessert sundae after dinner. The only downside though is for kids who are true steak lovers because the Angus Barn kid's menu has a variety of typical kid-like items, but the only steak choice for kids is a chopped hamburger steak. I've talked to many parents (you know parents today have more sophisticated little foodies) who frequent this venue year after year, and they all have expressed their desire for a small filet option for kids. Angus Barn, are you listening? I've got one child aging out of the Angus Barn kid's menu. He'll be 13 this month and he has had an aversion to any kid-type menu for years. My son is one expensive date these days. But, I do think more and more elementary-school-aged children are eating fish and filet cuts of beef these days. Things have changed since the 60s. And I must not forget the ladies parlor for little girls like mine. I think Liza remembered the bathroom experience more than anything. It's a fancy parlor and they have all these toiletries to powder your nose. It's a little girl's adult version of the blingy store Justice. Can I wait for a Table at the Angus Barn? During the week, you may have more luck waiting around for a table, but the wait is long. 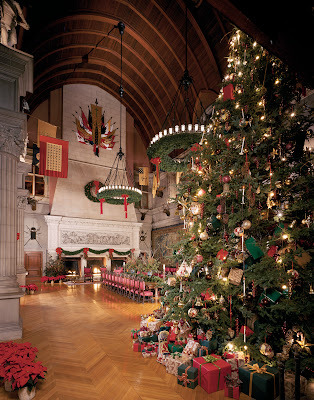 Good thing you have lots of holiday decor and elves to view while you wait for a table. 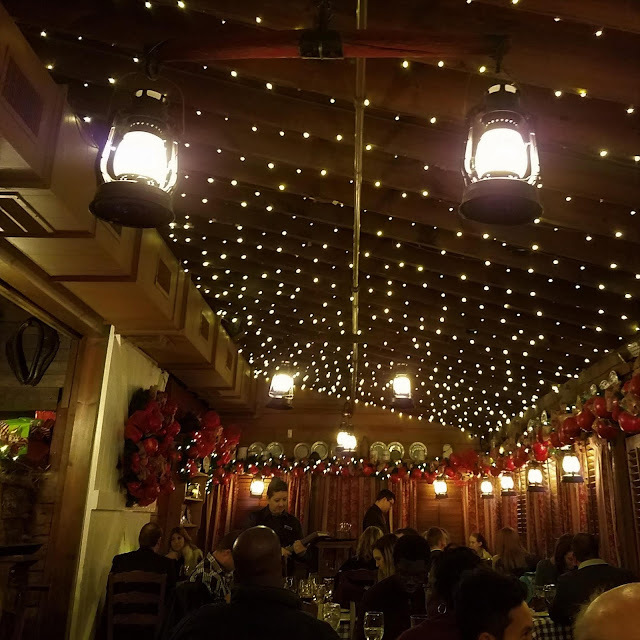 However, the Angus Barn Wild Turkey Lounge, which is upstairs in the restaurant is a first-come, first-serve no reservation dining with a full-service menu. It is open in the early afternoon during the holidays with a special sandwich type menu and it typically has live music at night. I personally think this part of the restaurant is charming. 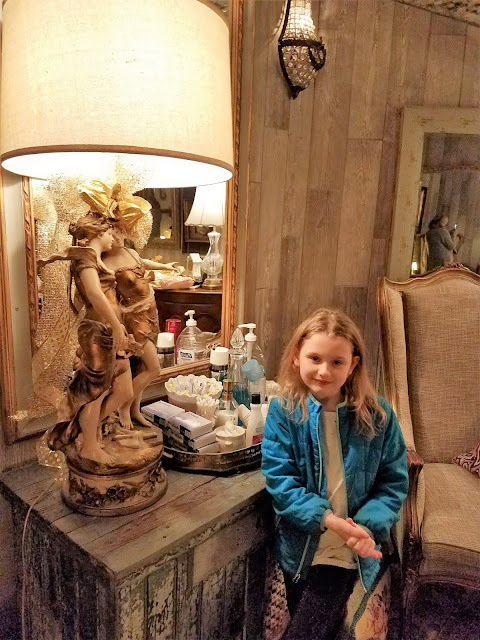 It is a sophisticated bar so if you have older children like I do who are used to dining in luxury hotels and do not have to dine off a kids menu, I would not hesitate to dine here in the late afternoon with them at all. Dining in the Wild Turkey Lounge offers elegance without the family bells and whistles of downstairs. I think the Christmas season makes this lounge even more appealing. 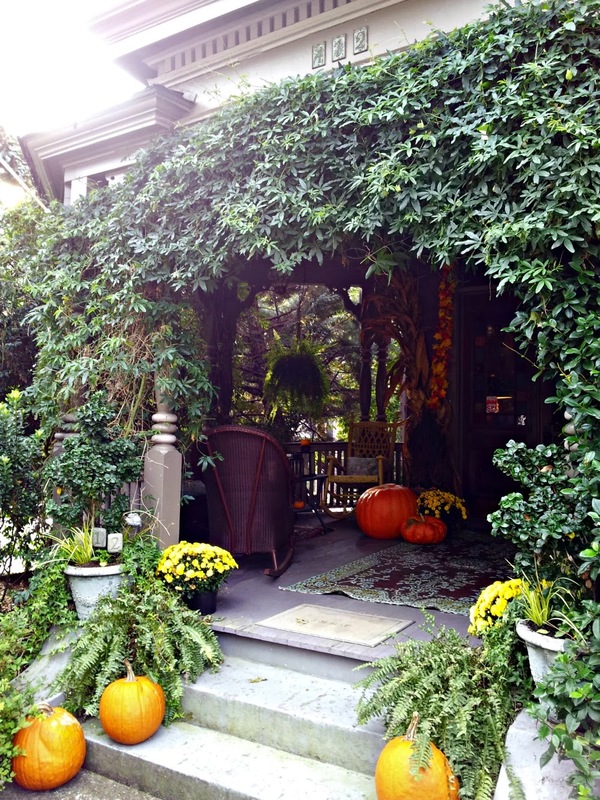 Have you dined at the Angus Barn in Raleigh, N.C? The Angus Barn also have a Pavillion that hosts private parties. In December, parking is at a premium. It, of course, is free to look around the Angus Barn. 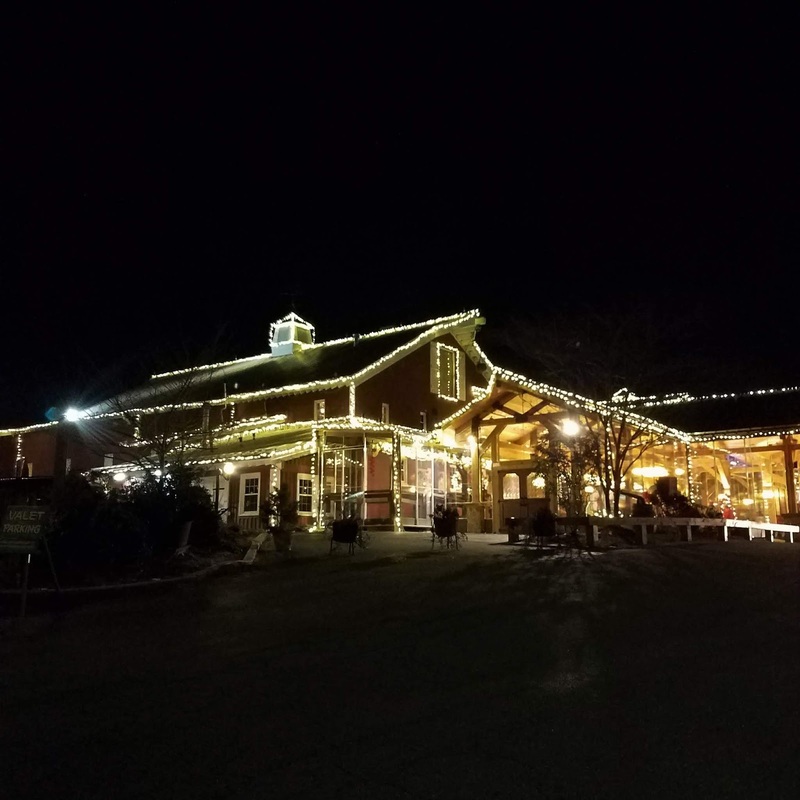 The Angus Barn is closed on Christmas Eve, Christmas Day and New Year's Day. 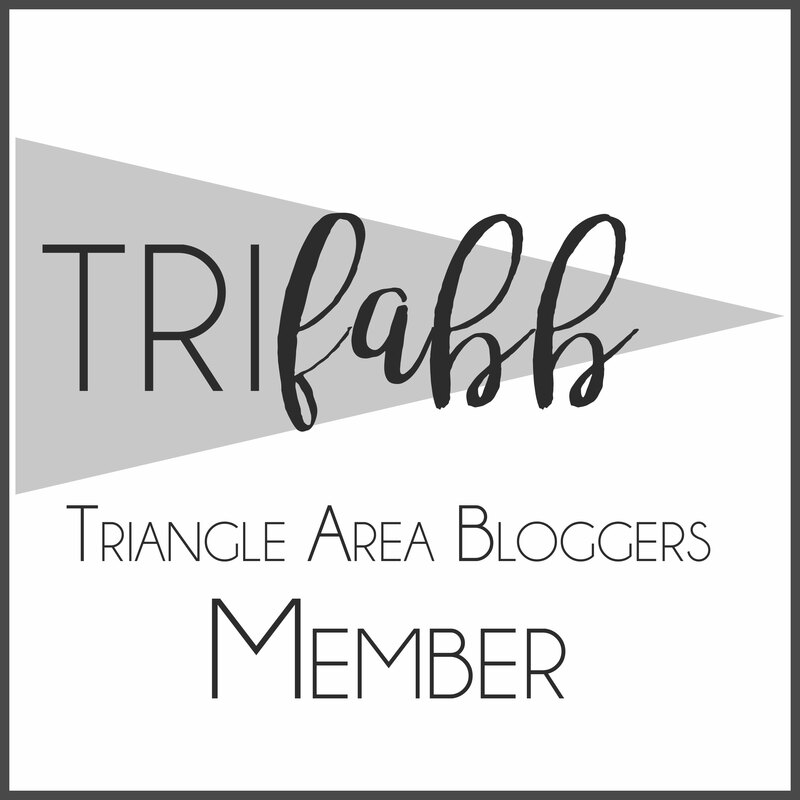 My time to write this post was made possible by blog local sponsor, Gladwell Orthodontics in Raleigh, N.C. I last visited the Angus Barn on my birthday after Christmas in 2017. All photos were taken by Leigh Powell Hines, and are subject to copyright. 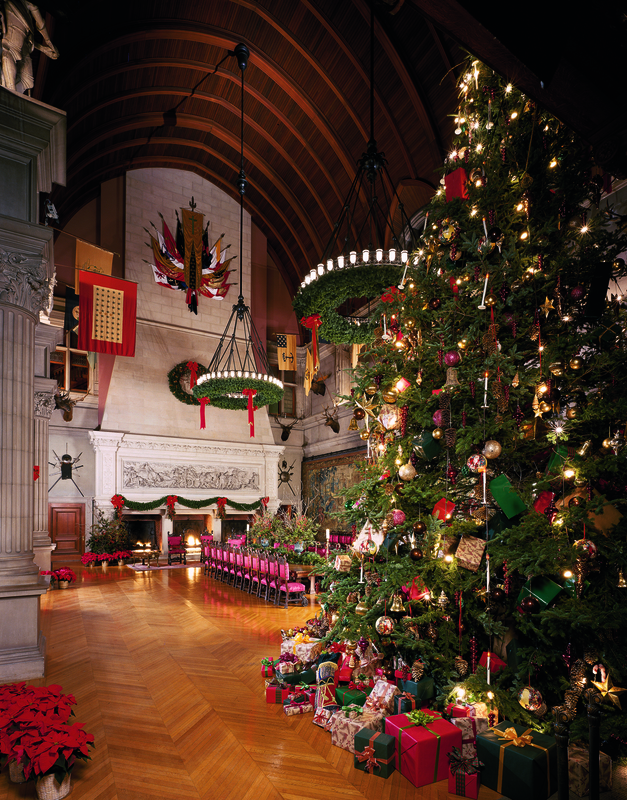 Does your family have a holiday tradition? 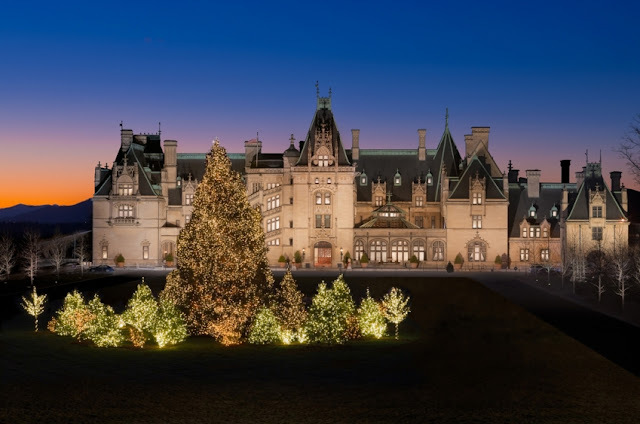 Perhaps, it is picking out a Christmas tree in the NC mountains or simply serving hot cocoa to Santa on Christmas Eve. For my family, our tradition is a tree-trimming gathering. Last year, I didn't host one because we were still in the middle of our move to our current house. 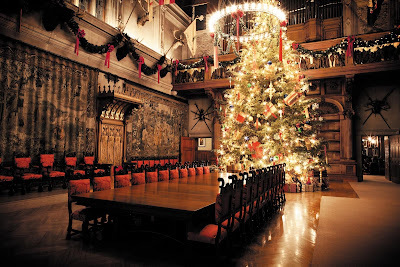 By skipping a year, I learned that I must have established a post-children "family tradition." 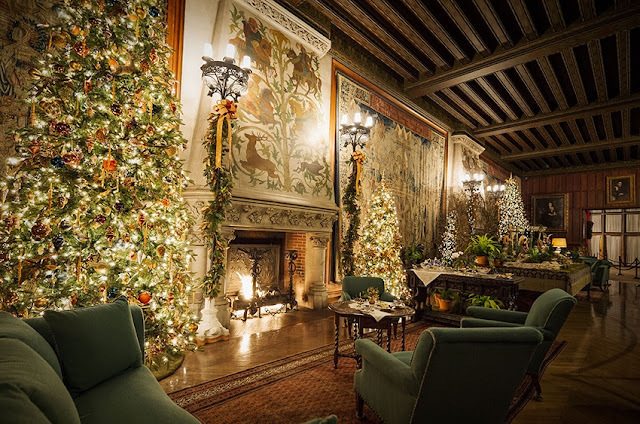 My Mom told last week that she could not believe I did not do the tree trimming meal last year because she looks forward to the tree-trimming more than Christmas. Honestly, I think it's my chicken tetrazzini recipe the most. I usually make that entree with my wintry green salad with cranberries and citrus. But, regardless of what I make, our tree-trimming gatherings are usually crazy family affairs. Like most days, the kids usually fight, an ornament or two get broken, Will usually complains I'm not helping enough with the tree. 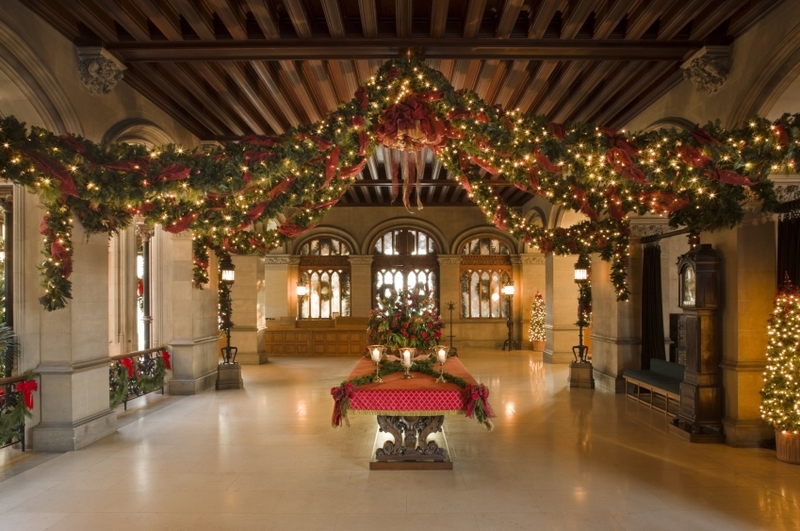 And, of course, we always have the traditional struggle with those darn holiday strands of lights. One bulb is out every single year. 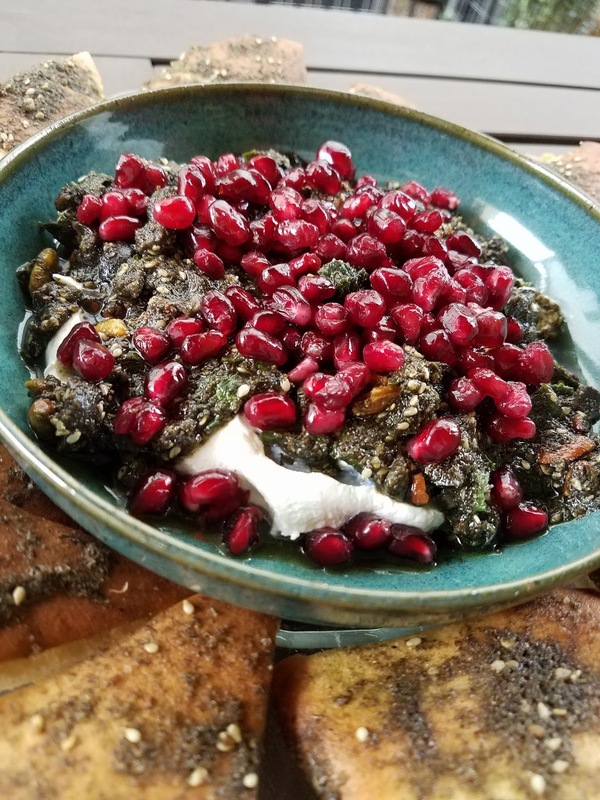 A great appetizer idea for a holiday gathering is a recipe I discovered the from the local Cary Mediterranean restaurant, Sassool. Simone Saleh, shared her family's recipe with me when I met for her a media interview. This is a healthy holiday idea that sparkles. I interviewed Simone for a Live #OutaboutNC moment where she pulled items from the restaurant's new market area for this labneh dip recipe. She also gave me insight into Lebanese food. In the live moment, we learn how labneh is used for many Mediterranean dishes. I had never tasted it before and it's difficult to find, locally, except in specialty stores. Sassool carries it in its Lebanese market in Cary, NC. Labneh can also be used as a substitute for recipes that use sour cream. I think its rich, creamy and delicious. Labneh is the key ingredient for this "All Dolled Up Labneh Dip" along with mint, olives, olive oil and zaatar spice. You serve it with your own homemade pita chips. Enjoy this recipe this holiday season. North Carolina is number one in sweet potato production in the U.S. You will find sweet potatoes on many menus in North Carolina and at the Farmer's Market when you visit. We even make our vodka with sweet potatoes. However, North Carolina also ships sweet potatoes everywhere. This educational feature about the "Life of an N.C. Sweet Potato." makes me realize how important North Carolina is to the world when it comes to the crop and harvesting of sweet potatoes. 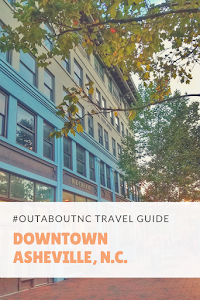 There's a good chance that the sweet potatoes you use to make your delicious sweet potato casserole or sweet potato pie came from N.C.
As founder of @OutaboutNC on Instagram, I have learned from my NC travel community that culinary travel is a huge part of the charm when guests plan a first-time trip to visit North Carolina. That's because my home state is historically an agriculture state. Farming is at the root of our rich heritage so when you visit NC, you want to taste the food. Food needs to be part of the travel experience. NC chefs and restaurants that specialize in farm-to-table cuisine are winning over visitors.regularly. As more national magazines highlight NC chefs throughout the state, reservations are getting harder to come by at many NC restaurants, unless you plan weeks or months in advance. The reason these restaurants are so popular is that they feature dishes using fresh ingredients from North Carolina farms. Here are eight great recipes that put sweet potatoes as the star of the main meal to you in your own home. 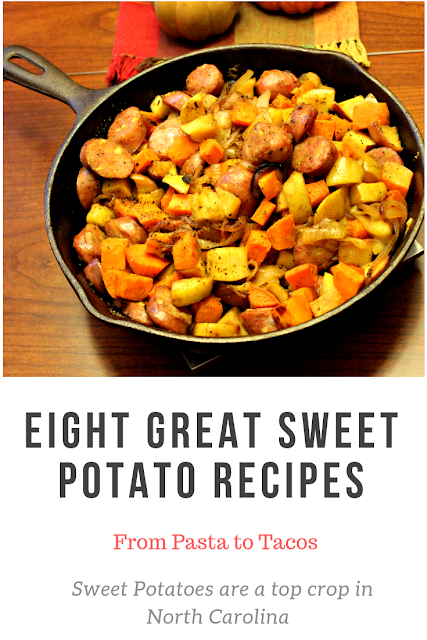 Sweet Potatoes are a low-calorie vegetable and are good on the grocery budget. There are many health benefits for eating sweet potatoes. They are a good source of Vitamin C and A, and other nutrients. Even though they are a starchy vegetable, they are high in fiber and are a slow-burning carb which keeps blood sugar levels lower and sweet potatoes are rich in potassium, which can also aide in lower blood pressure. Many people get confused between yams and sweet potatoes. We don't produce yams in North Carolina, and when Southern people refer to yams, they most likely mean sweet potatoes. The N.C. Sweet Potato Commission sums it up best. A true yam is imported from the Caribbean and is quite different from a sweet potato. But, a sweet potato has many, many varieties and its flesh can be white, orange, and purple. The orange variety was introduced decades ago, and in order to distinguish it from the white-flesh sweet potato, suppliers and producers chose an English form from the African-word,"nyami" and labeled "yam." 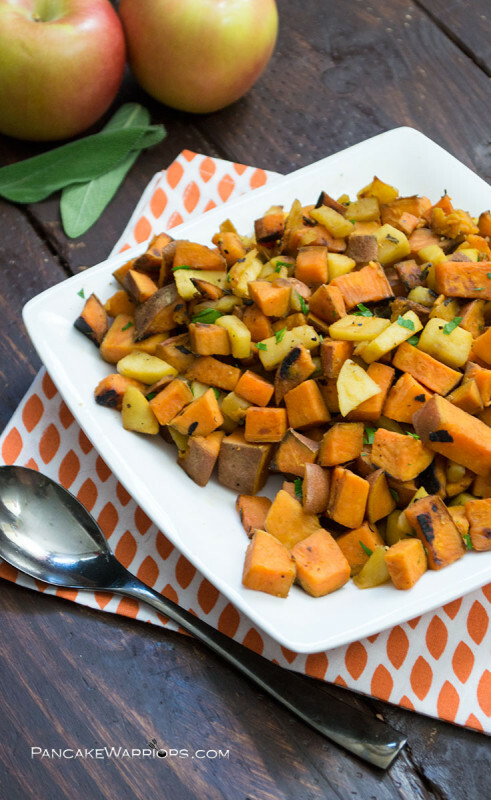 Sweet potatoes are almost always incorporated into a Thanksgiving menu. But, the vegetable can be used in so many recipes other than a sweet potato casserole. From pasta noodles to the filling for tacos, sweet potatoes are versatile. Many N.C. restaurants serve a side of sweet potatoes with their burgers, too. The following eight recipes will help you put sweet potatoes on your menu. All recipes shared here are with permission in a collaborative effort. 2. 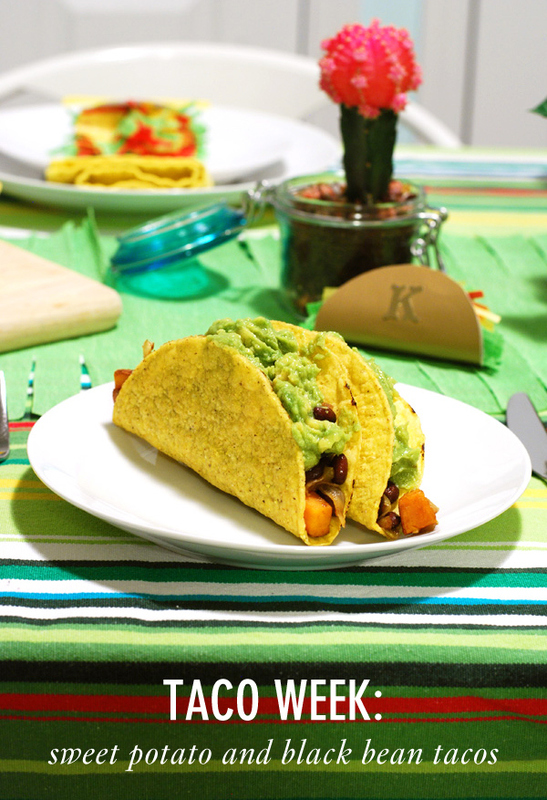 Sweet Potato and Black Bean Tacos from the N.C blog, TwinStripe. 3. 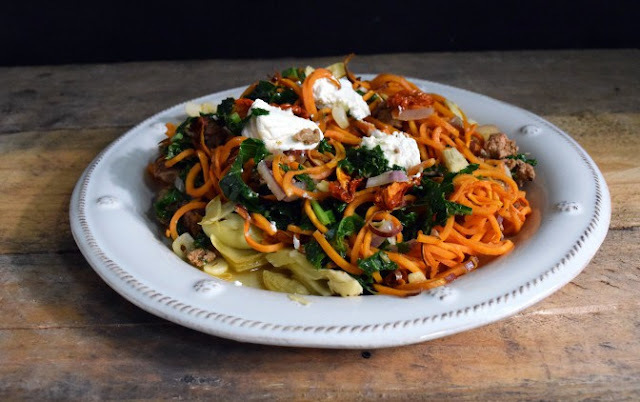 Mad Sweet Potato Pasta from Nourish and Nestle. 4. 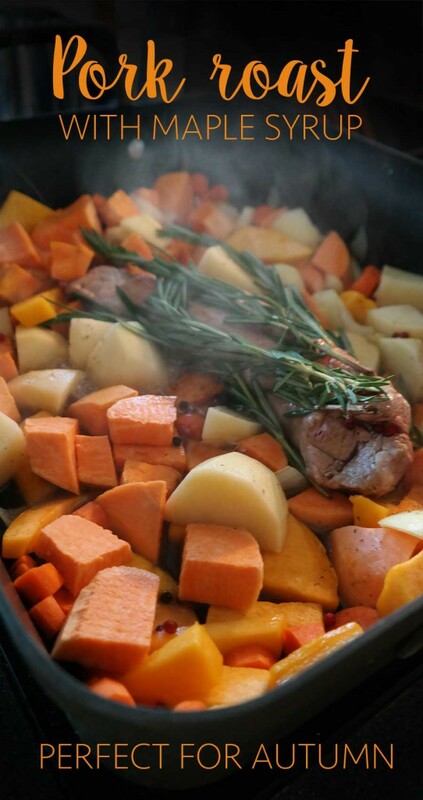 Pork Roast with Sweet Potatoes and Maple Syrup Katja Presnal of Skimbaco Lifestyle. 5. 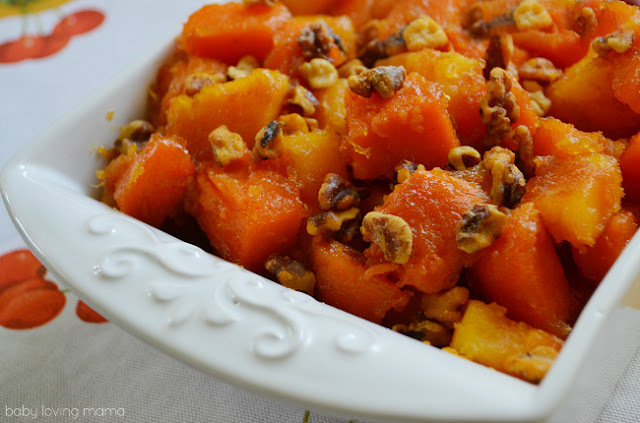 Glazed Sweet Potatoes with Toasted Walnuts from the Minnesota-based blog, Baby Loving Mama. 6. 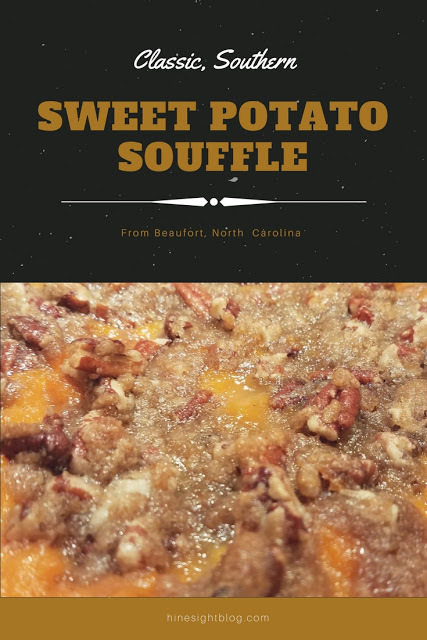 Sweet Potato Souffle from North Carolina's third oldest town, Beaufort, N.C. I love this recipe and now make it for Thanksgiving. 8. 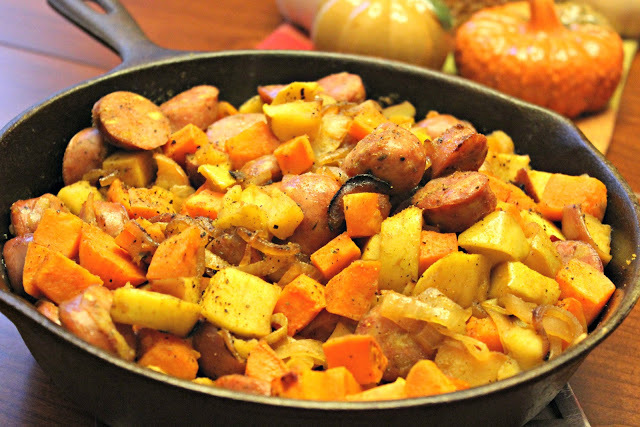 Quick Apple Sweet Potato Hash from Bites of Wellness. Post originally published in 2015. Updated in November 2018. My time for writing, updating and sharing these recipes are made possible by HinesSightBlog sponsor, Lane and Associates Family Dentistry in Raleigh at Wake Forest Road. 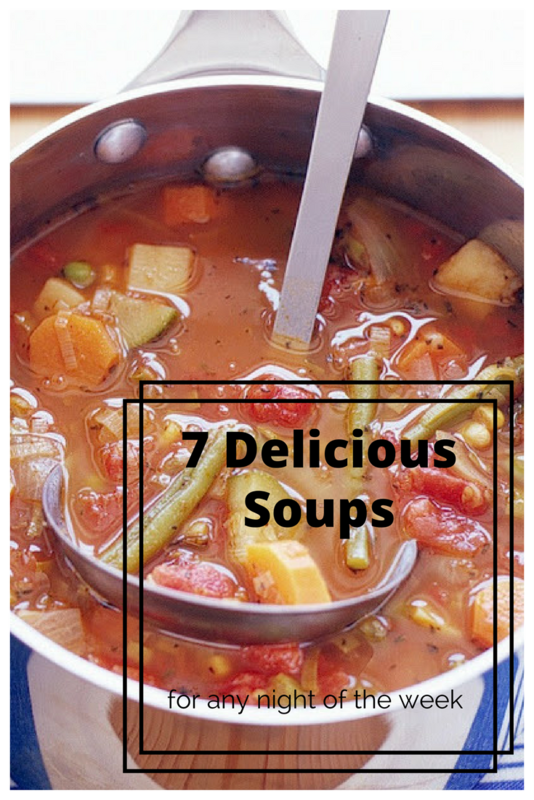 As soon as the temperature drops, I love to read soup recipes and put a pot of soup on the stove. In North Carolina, official soup weather begins late October through the winter months. This is when you will start seeing more soups offered in Triangle restaurants. I think many of our Raleigh area restaurants offer delicious soups in season. 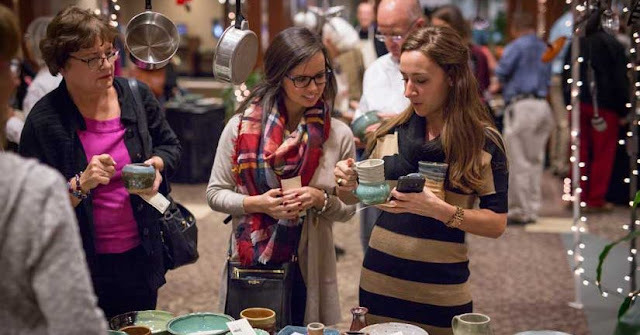 Each year, local Raleigh chefs get souped up and serve some of their favorite soup recipes for charity. When I dine in Raleigh restaurants, I like to order a lot of creamy based soups such as butternut squash, carrot, potato, tomato, coconut curry, and even beet soup. Will jokes that anytime there is a butternut squash, carrot, tomato, or a beet soup listed at a local restaurant, he knows I will order it. The soup can be in a pub, deli or high-end restaurant and I order it almost every time. The main reason I order that type of creamy-based soup out a lot is that I'm too lazy at home to make something pureed and creamy smooth. I do not own a hand blender and I think that is an essential chef's item for rich, creamy soups. One fall, I was dining at our local five-star hotel property when I was on assignment for a Forbes piece at the Umstead Hotel's Bar and Lounge for lunch, and butternut squash soup was on the menu. I loved it so much I ordered a second bowl. Who does that when the soup is $9 a bowl? It was worth it to me at the time. I had to have more. I still talk about a carrot soup I ordered at a pub in Ireland in 1998. No doubt, I like it when a professional chef makes a soup. In my own home, I tend to make more stews and chilis. The soup that I make most often is a vegetable beef soup that is a combination recipe that I put together from both of side of my grandparents. 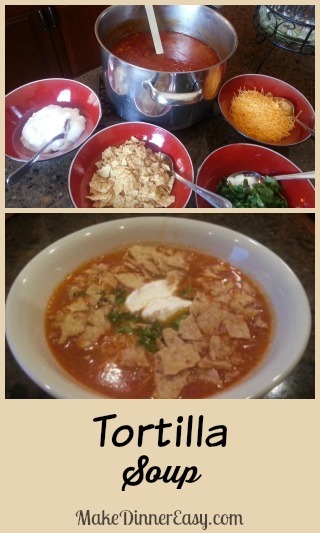 It's my absolute favorite soup and I could live off of it during the winter months. Once again, I am honored to be a local judge for Urban Ministries of Wake County Stone Soup Supper Event. This charity event is a highlight of the fall season for me. Proceeds raised from this event support programs that feed, shelter and provide health care for Wake County residents. It is a fun night in Raleigh, and I love to taste the chef's creations. I also enjoy learning more about Raleigh each chef and the styles they tend to favor in their cuisine. 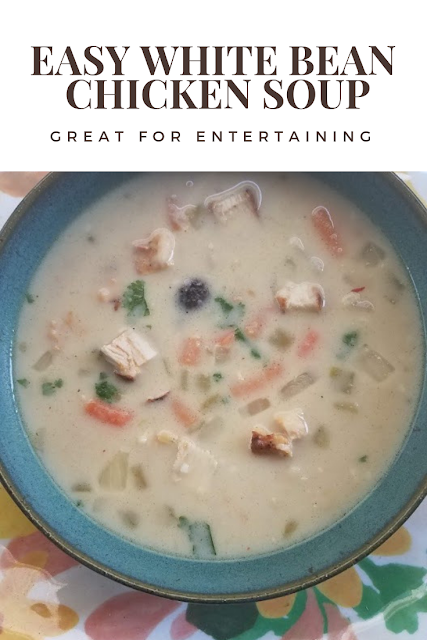 In honor of my being a judge for the second year in a row for the #GetSoupedEvent, I wanted to share some soup recipes from my virtual colleagues. These are some of the recipes from their own kitchens. 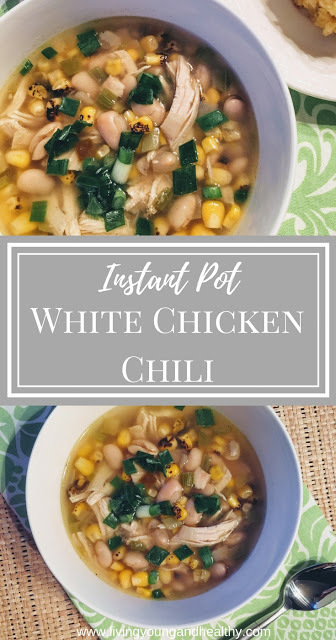 Instant Pot White Chicken Chili by my business partner, Kim on Living Young and Healthy. 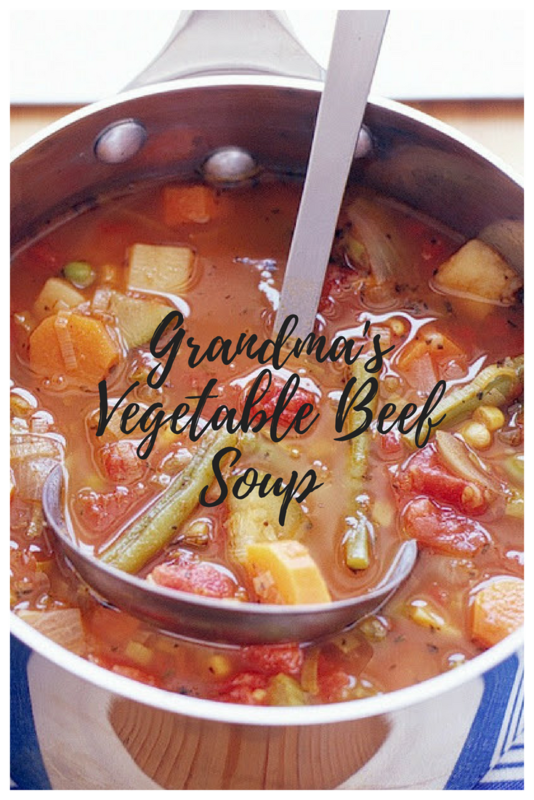 This recipe can be made on the stove as well, which is how I had to make it since I do not own an Instant Pot. It is delicious. 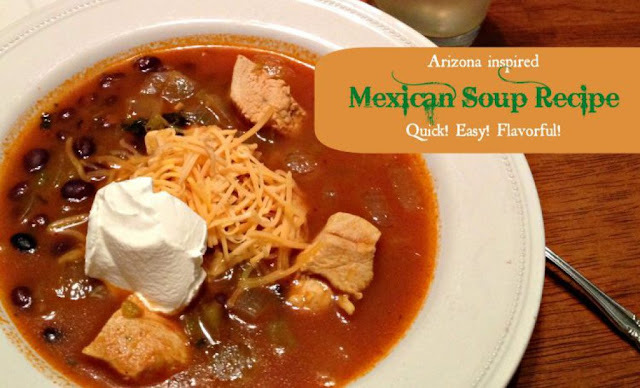 Arizona Inspired Mexican Soup from Karen Dawkins, Family Travels on a Budget. 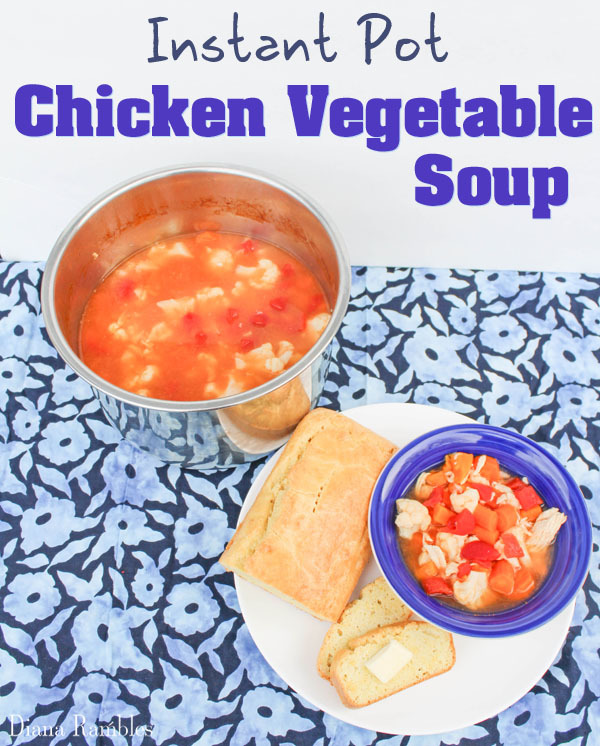 Instant Pot Chicken Vegetable Soup from Diana Rambles. 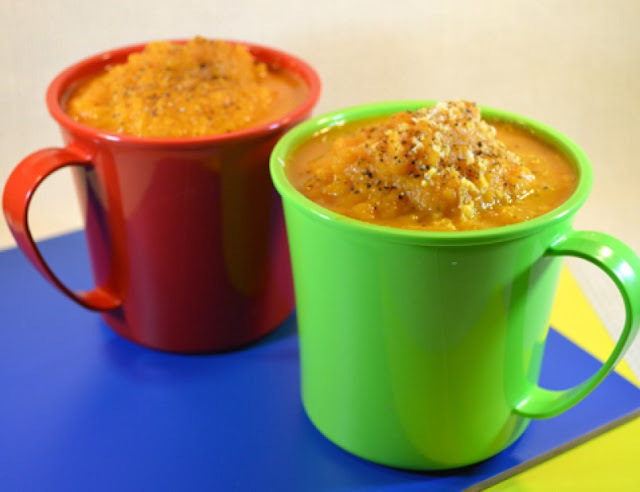 Tomato-Basil Bisque Soup from Michelle, of Honest and Truly. I would love to hear about your favorite soup. Put the recipe on my blog's Facebook page. 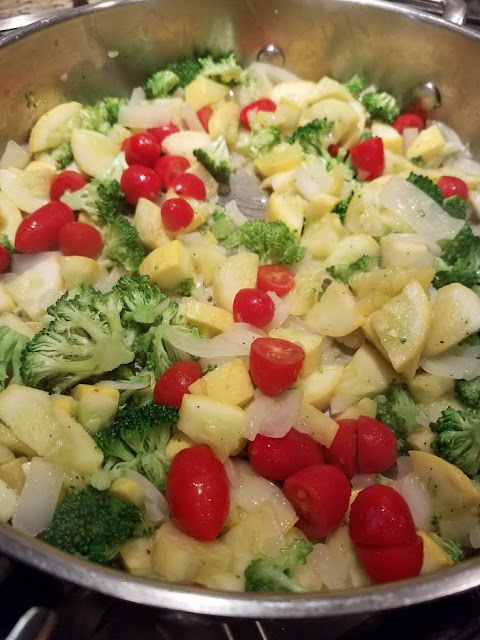 My time for writing and sharing these recipes is made possible by HinesSightBlog sponsor, Auto Brokers of Paintsville where you will find a great inventory of new and used vehicles for sale. Historic Oakwood in Raleigh, N.C. was the city's first neighborhood. 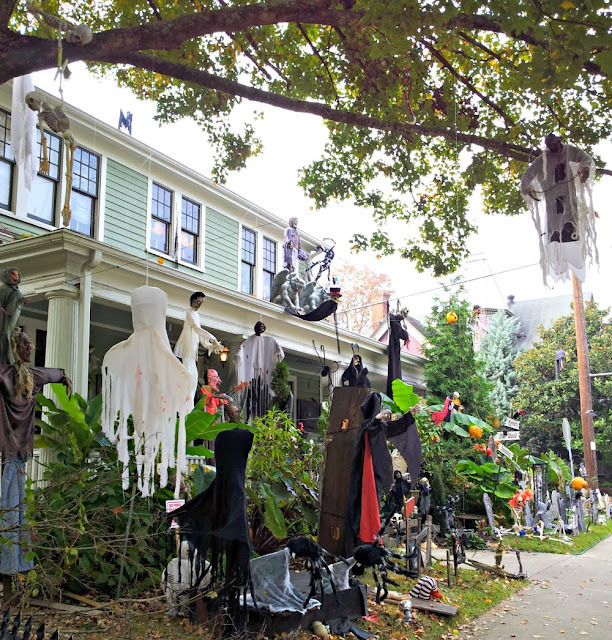 It was Raleigh's first middle-class suburb and now it is in the heart of downtown Raleigh. 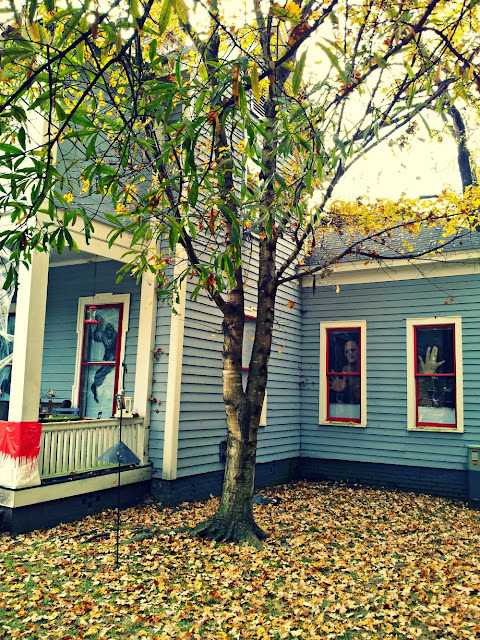 It's within walking distance to most anything downtown. Oakwood has so much character, and is a neighborhood on the National Register of Historic Places and known for the Historic Oakwood Cemetery, which was founded in 1869. The neighborhood is beautiful during the holidays and it gets spooky in October. If any area is haunted in the city of Raleigh then my bet would be on the Oakwood area. 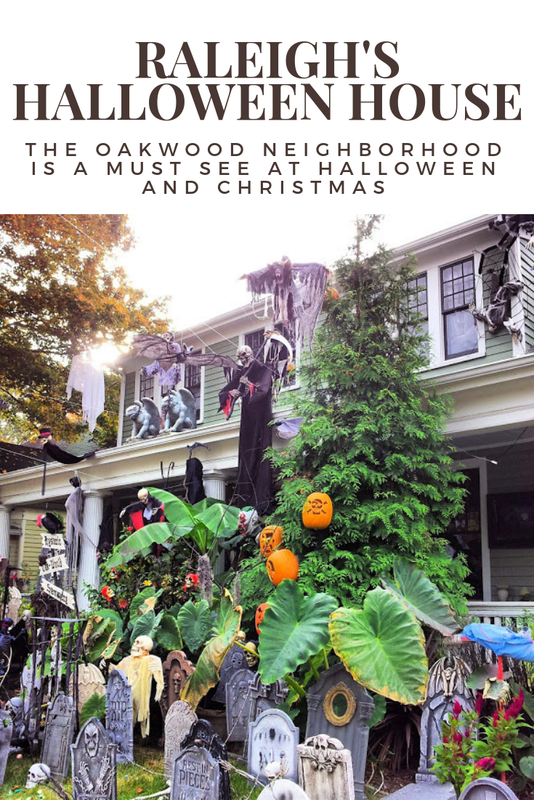 I've always loved the houses in Oakwood neighborhood, and when we were house hunting in 2003, I strongly considered Oakwood because of its location to downtown, but when I toured a house on the market at the time, something felt creepy about it. I can't explain it. But, I looked at Will and said, "Some of these houses could be haunted." 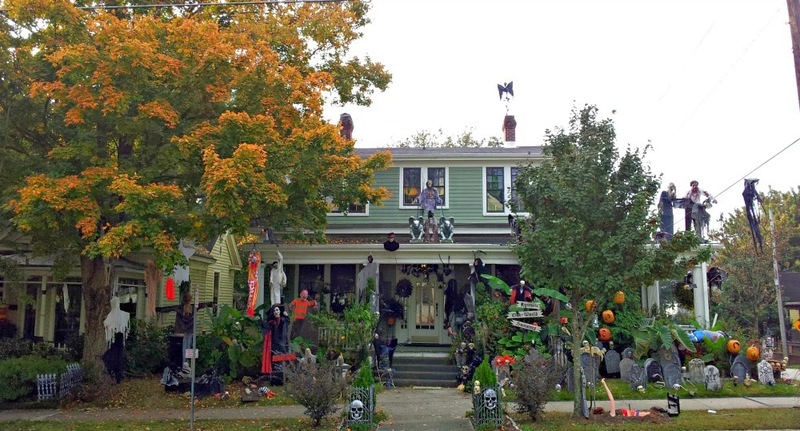 This home is on Oakwood Avenue and is now a fall tourist attraction. 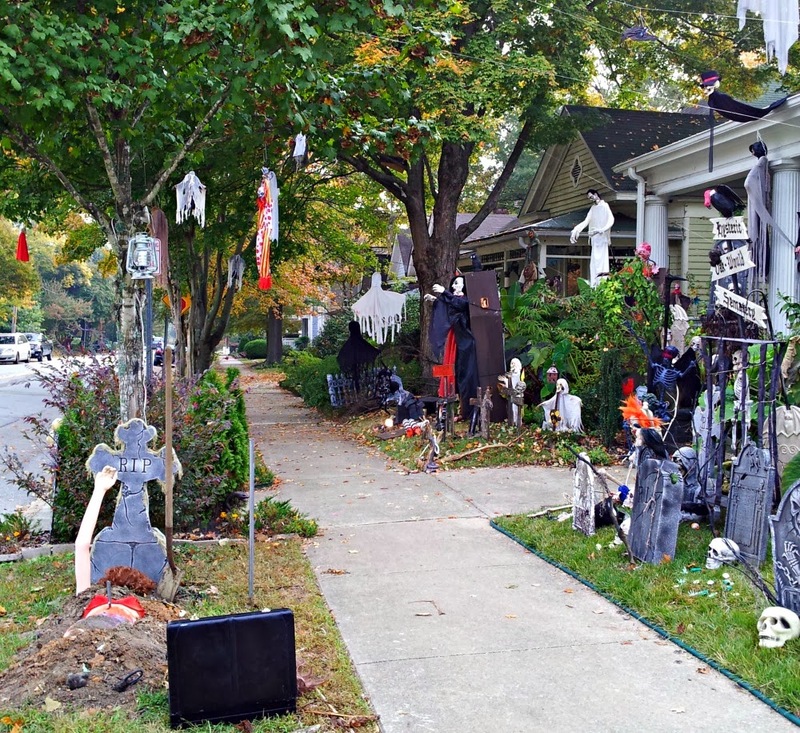 The average home price now for the Oakwood area is about $500,000. As the area becomes more desirable, prices rise. Some houses still look a little creepy in Oakwood without doing a thing for Halloween. 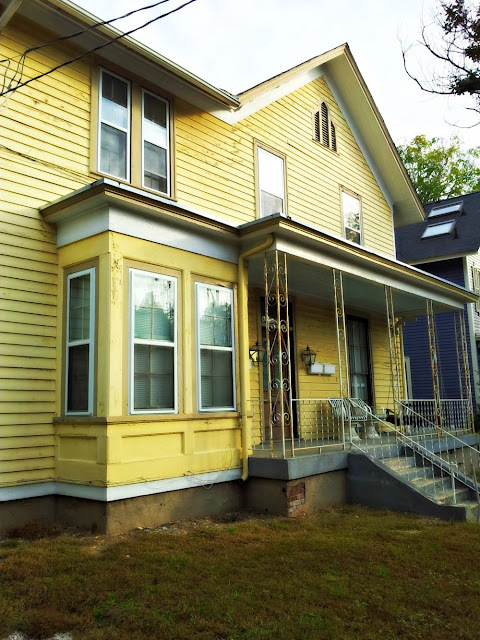 It does take a lot of work and money to renovate these houses. 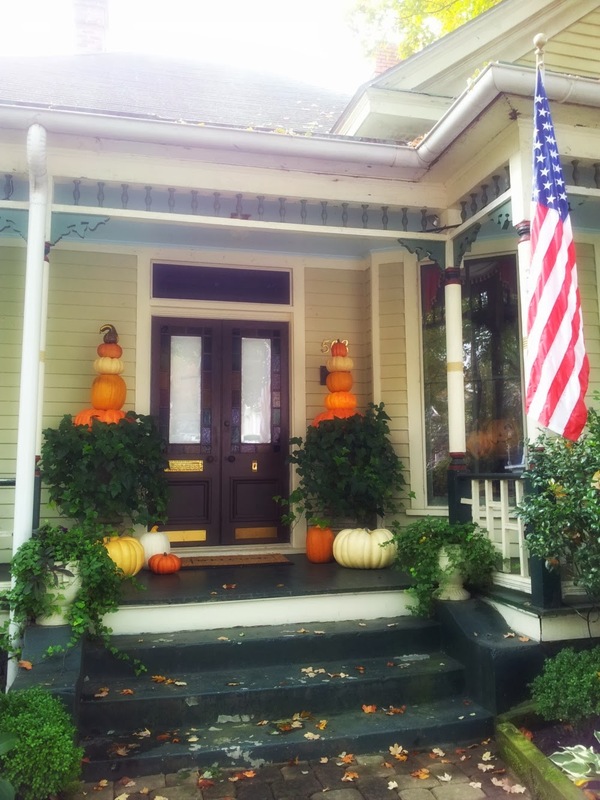 Pretty pumpkins are more my style in October. This is one of my favorite homes in the Oakwood neighborhood. 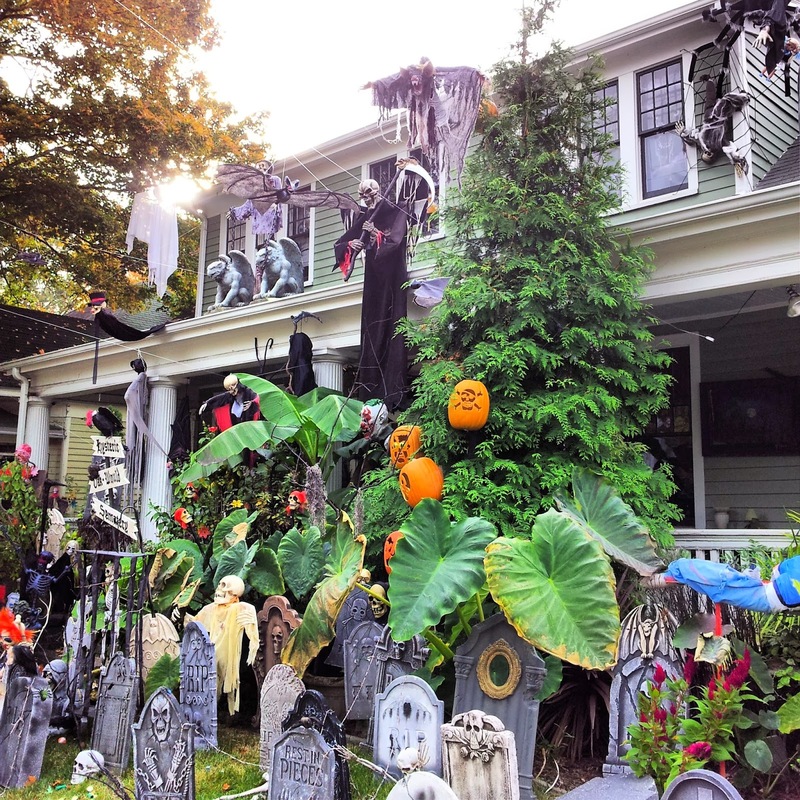 Rumor has it that the spooky house will give out more than 1,000 pieces of a candy in an hour on Halloween. But, knock on that door at our own risk. Plastic black snakes are known to fall from the sky. I would DIE. Honestly, I was too creeped out to walk by the house on the sidewalk so I probably could have gotten a lot more pictures, but I was scared. 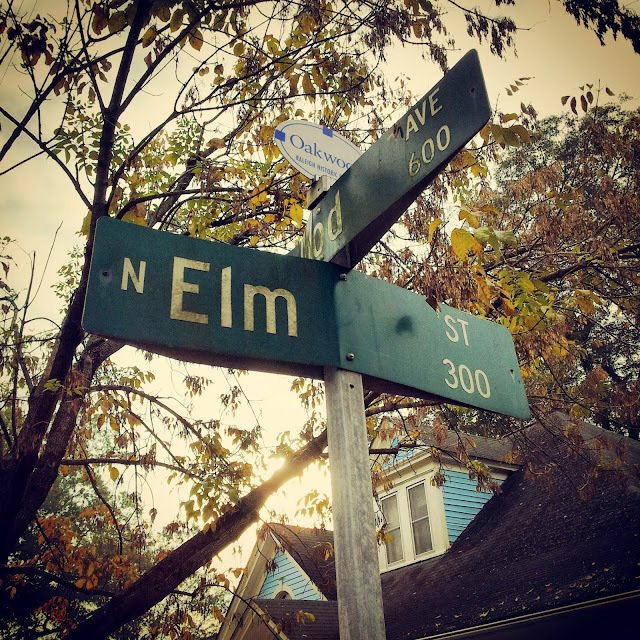 Elm Street is just around the corner. Walk at your own risk. Will Freddy Kruger pop out? I prefer to tour the area at Christmas. 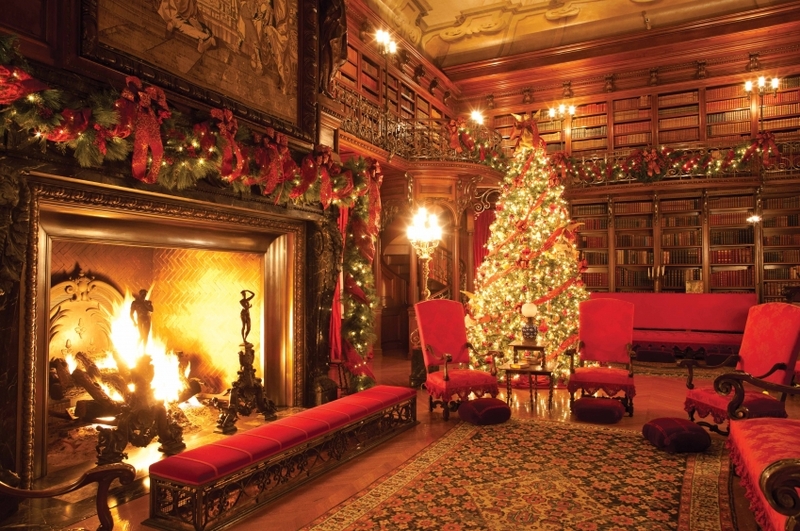 The 47th annual Historic Oakwood Candlelight Tour will be this year. Tickets are on sale now for this event which usually sells out.